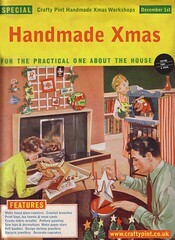 We are so excited about the workshops we have planned for this year’s Xmas Crafty Pint! 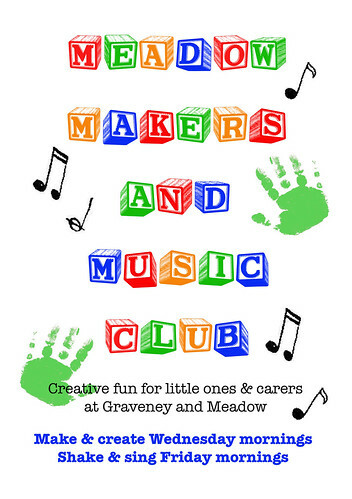 We will have everything from making fabric wreaths, paper stars, fused glass coasters and tea light holders to sewing mini-toys,crocheting brooches, painting pottery, felting baubles, as well as designing shrinky and upcycled jewellery and cake decorating. And then you can make your own cards and wrapping paper to go with them! Our workshops are suitable for all ages and abilities and our experienced tutors have adapted versions to suit small hands and big ideas! Here’s a taste of all the different things you can make at this year’s Xmas Crafty Pint. And then please do follow our blog over the next week to meet all of our tutors. Mandy will share the secrets of traditional German (Froebel) star construction and show you how to make these delightful paper stars from her collection of beautiful papers. Perfect as ornaments to hang on your tree, in your window or use to adorn your gifts. This workshop will run from 2.30pm (after the glass workshop). Prices from £1 (small star), £2 (medium) to £3 (large). Make your very own fused glass coasters and tea light holders. Fused glass artist Mandy Treptow will demonstrate the principles of working with Bullseye glass and the different effects that can be achieved. Choose from Mandy’s collection of brightly coloured raw glass to design and make your own glass coaster or tea light holders. Pick your favourite colours to make gorgeous designs with glass pieces, stringers (for patterns and lines) and copper foil for inclusions. There is no glass cutting involved in this workshop. Mandy will take your finished designs and fire them in her glass kiln and then return them to you by post. These will make very impressive and unique gifts, or you might want to keep them for yourself! This workshop will run in sessions at 12.30 and 1.15pm. Price £10 includes all materials, firing and postage. Pre-booking recommended – details here. Meet Tania, crochet superstar! She will show you some simple crochet techniques that you can use to make sweet brooches. 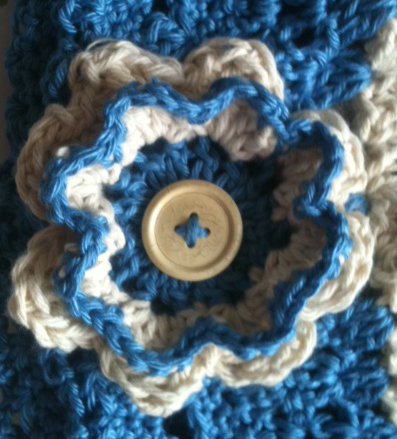 Young children can decorate ready made crochet flowers to create their brooches. Or use them as decorations or to make cards. Lovely Caragh returns again this year with her pottery painting workshop. Participants can enjoy a relaxing afternoon painting and decorating from a selection of bisque using a huge selection of colours, with Caragh on hand to offer advice and guidance about painting technique using various tools, brushes and sponges. Allow one week for the firing process and participants can arrange to collet their pottery from Caragh at her studio in Tooting or arrange to have it posted. Customers who would like their pottery posted must allow extra for P&P. Prices range from £5.00 to decorate a christmas decoration to £12 for mugs, small plates and bowls, £16 for cupcakes and £20 for a teapot. We are very excited about seeing all the lovely things you will be making with felting supremo Carol. Choose from jewel coloured fleeces and wools to felt beautiful baubles and then embellish with embroidery and beads. Gorgeous! Vicky Stars&Scars returns with her super-duper shrinky jewellery workshop. Design you own necklaces and pendants and then be amazed and awed as these are transformed into fantastic jewellery. Price £5 includes shrinky sheet, necklace chain and jump rings. Grab a handful of junk trinkets and turn it into cool contemporary jewellery with local artist and up-cycler Jeni. Feast your eyes on our treasure trove of jewels and with top tips from Jeni, turn them into original necklaces, earrings, bracelets and brooches. Price £8 for a necklace and pair of earrings. Join local baker and cake decorator Claire to discover the secrets of sugar and all things nice. Claire will show you how to use sugar paste or buttercream to ice your cakes and then how to make cute seasonal decorations for your xmas cupcakes, including reindeer, holly, santa, snowman, candy cane, penguin, polar bear. You will take home your own set of cupcakes. Price £10 to ice and decorate half a dozen cakes and take home in a box. If you are still searching for that perfect handmade gift, then design and print your own tote bag or tea towel. Join Gillian on the Mezz level to design and carve your printing block and then use this to print tote bags or tea towels. Prices from £10. Stitch up sweet mini-characters to give as toys or make into key fobs. These are very cute and perfect stocking fillers. Suzanne from Sew-together will set you with all the materials and instructions you need to make these lovelies. And once you’ve made all your fabulous presents, wrap them all up in gift wrap designed and printed by you! Cut out a printing block and use it to print up your own matching set of cards, gift wrap and tags. Price £15. Our workshops are available as drop-in sessions from 12noon to 6pm. Turn up on the day and take your pick. All workshops are individually priced, just pay for what you make. Entry filed under: Uncategorized. Tags: antic, christmas, craft, craft workshops, crafty, Crafty Pint, creative, crochet, cupcakes, DIY, fabric wreaths, felting, froebel stars, fused glass, handmade, handmade christmas, handmade london, london, paper stars, pottery painting, printing, sewing, shrinkies, shrinky, south london, SW17, tea towels, Tooting, tooting tram and social, totes, tram and social, upcycled jewellery, we make london, workshop, xmas. Win a copy of Inspired London! More than workshops!